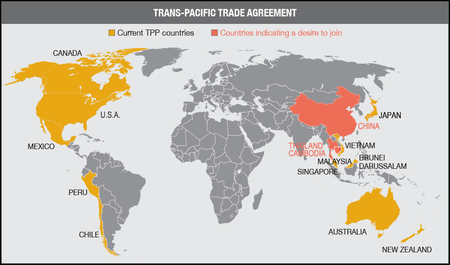 What to Make of the TPP’s Anticorruption Chapter? After years of being developed under conditions of absolute secrecy, the text of the Trans-Pacific Partnership (TPP) trade agreement was released last week. In the U.S., Congress has 90 days to give an up-or-down vote on the measure, which is expected to pass. Mexico is another one of the major members of the TPP, with the fifth-largest GDP of the twelve countries (after the United States, Japan, Canada, and Australia). Here’s a map of the TPP members so far (credit: aflcio.org). In Mexico, the route to approval is also through the legislature. Mexico’s Secretary of Economy indicated that the measure should be approved in the first trimester of 2016, giving the Mexican congress a bit more time than their U.S. colleagues. With the release of the text, a lot of analysis will start rolling out about the agreement’s 30 chapters and annexes. The most controversial chapters deal with intellectual property and investor-state dispute resolution. Also, the deal is controversial generally as the merits of ‘free’ trade have drawn greater scrutiny following the experience from similar agreements like NAFTA. I am not going to address these issues here, as I am not so ambitious and think they will be well-covered elsewhere. Instead, I want to focus on Chapter 26 of the agreement that deals with Transparency and Anti-Corruption, my area of expertise. Chapter 26 is grouped at the end of the TPP with a bunch of other chapters dealing with what are likely perceived as ‘soft’ issues (e.g., ‘Regulatory Coherence’, ‘Development’, ‘Cooperation and Capacity-Building’). I will focus on the anticorruption provisions, as the transparency part is relatively minimalist (essentially requires countries to publish laws/regulations and any pending changes). The anticorruption provisions are interesting – in many ways they overlap with other international agreements like the OECD Convention on Combating Bribery of Foreign Public Officials, the UN Convention Against Corruption, etc. Article 26.7 requires members to adopt laws creating criminal liability for active bribery (bribe givers) vs. passive bribery (bribe takers), both of domestic and foreign officials, as well as any conspiracy to commit such offenses. Most – if not all – of the TPP members will already have laws on the books to this effect (the top 5 countries certainly do, as they are all OECD Convention members). The interesting section is Article 26.7.3, which states: “Each Party shall adopt or maintain measures as may be necessary, consistent with its legal principles, to establish the liability of legal persons for [bribery] offenses.” The section is interesting because many countries’ legal systems – including Mexico’s – do not have the concept of corporate criminal liability. The concept has a long history in the United States, where corporate ‘personhood’ has existed since the 1886 Supreme Court case Santa Clara County v. Southern pacific Railroad. Some of the other TPP countries – e.g., Canada, Australia – have recently adopted statutory bases for corporate criminal liability. But their application of the concept is more limited than in the U.S. Japan’s current criminal law does not include the concept of corporate criminal liability. Mexico’s legal system has traditionally not recognized the concept of corporate criminal liability. And even where it has agreed to adopt the concept under an international agreement – notably, the OECD Convention dealing with bribery of foreign officials – Mexico’s implementation has lagged. In 2012, Mexico passed a law on bribery in public procurement that included liability for legal persons, but enforcement under that law has been non-existent. So, in principle Chapter 26 would require Mexico to amend its laws to adopt corporate criminal liability for bribery of local officials in all situations (right now, it only covers bribery of foreign public officials and bribery of local officials in relation to procurement). It is unclear whether the qualifying language – ‘as may be necessary’, ‘consistent with its legal principles’ – allows Mexico to just ignore this requirement. Chapter 26 also includes a ‘books and records’ section related to anticorruption. Article 26.7.5 requires members to adopt laws “regarding the maintenance of books and records, financial statement disclosures, and accounting and auditing standards,” all aimed at preventing a specific list of practices: off-the-books accounts; inadequately identified transactions; recording non-existent expenditures; entry of liabilities with incorrect identification of objects; use of false documents; and intentional destruction of bookkeeping documents earlier than foreseen by law. Footnote 7 limits this section in the U.S. to issuers, where it’s already a requirement anyway under the Foreign Corrupt Practices Act. The footnote continues, “For greater certainty, the Parties recognize that individual cases or specific discretionary decisions related to the enforcement of anti-corruption laws are subject to each Party’s laws and legal procedures” (huh?). It is unclear to what extent current Mexican law would meet the requirements of Article 26.7.5. The accounting requirements imposed on private companies in Mexico are arguably more stringent than in the United States, and could be seen as prohibiting the practices enumerated in the TPP. In light of the qualifying language, it seems that Article 26.9 was a source of concern among the TPP members with higher levels of corruption and lower levels of enforcement. Japan and Australia are excellent examples of countries that have lagged in enforcing laws against bribing foreign officials, and are frequently harangued by the OECD for it. Mexico is perhaps the best example among emerging markets for refusing to enforce domestic anticorruption laws. Thus, it would not be surprising to learn that the United States pushed to include Article 26.9.1, with Japan, Australia, and Mexico leading the charge for Article 26.9.2 and Footnote 8, the language of which appears to take all the teeth out of Article 26.9.1. Chapter 26 – Remedy or Placebo for a Global Problem? Does it matter that the qualifying language in the anticorruption sections leaves us with a largely symbolic statement that ‘corruption is bad’? I would argue that it does. The agreement is designed to promote trade and investment in and among the TPP members. For better or worse, you need to evaluate its provisions from the perspective of foreign investors wishing to operate in the other member countries. And these investors frequently cite corruption as one of the top five barriers to doing business in Mexico. Coincidentally, Mexicans consistently cite corruption as the most significant problem facing the country after crime (which of course is facilitated by corruption). Indeed, the desire to fight corruption is one area where the interests of foreign investors and local citizens are unequivocally aligned. Thus, it is unfortunate that the TPP negotiators reduced Chapter 26 to a superficial values statement. The same analysis applies to countries with low enforcement of laws against foreign bribery like Japan and Australia. Companies from these jurisdictions get a ‘pass’ for their criminal conduct in countries more corrupt than their own. So they are able to play by the ‘local’ rules at no risk where a U.S. company cannot. In many ways, Japan and Australia’s permissive attitude towards foreign bribery by their companies is a sort of protectionist measure that makes those companies more competitive. Indeed, to the extent Japanese and Australian multinationals worry about facing prosecution for paying bribes abroad, it is enforcement by the U.S. authorities under the FCPA. Again, it is unfortunate that the TPP seems to enable Japan and Australia’s anemic enforcement, rather than end it. This entry was posted in compliance, corruption, crime, economy, fdi, tpp, trade. Bookmark the permalink.